One of our regular patrons has a radio show on a local station. He found some copyright-free songs on YouTube, and wanted to know how he could record them to play on his show. However, most of the usual ways require more access to the computer than we allow the public to have. 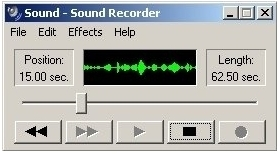 Patrons cannot install software or get to Windows Sound Recorder, so he wanted something easier. An internet search lead us to the website vixy.net, which is exactly what he wanted. Enter the url of the online video you'd like to record, choose the output file type (mp3 is an option), click start, wait, and then download the audio file. Nice. The system is still in beta, and lists right on their homepage some of the errors you might encounter (after working with it awhile, the patron said he got an error on about one in three attempts). But when it works, it works, and it gave the patron exactly what he was looking for - mp3 files he could save to his flash drive. But let me leave you with what I told him: just because something is possible doesn't mean it is legal. It is up to you to check to make sure the copyright on published work allows for this type of recording. Patron: I can't open a file on your computer. Me: Oh; what kind of file is it? Patron: It's just my resume. My sister updated it for me on her new computer, but her printer is broken, so I came here to print it out. But now it won't open. It works fine at her house. The two key parts of the patron's last statement are resume and new computer. These words almost always indicate a Word document created on a Microsoft Vista computer running Office 2007. My library's computers have Windows XP and Office 2003, which cannot open Office 2007 documents due to the change in file formats. Our IT person found a plugin that will allow Office 2003 programs to open Office 2007 files. This plugin is available from the Microsoft download center. We have installed this on the computers at the reference desk, but not yet on all the public computers (we are changing the profiles on all of those, and this plugin will be part of it). And of course, since installing it, I haven't gotten this question again.